I thought today, as I’d mentioned Mary Shelley (Godwin) in my Halloween blog, that I would start the stories of the sisters of the Godwin household in this weekend’s tale of scandalous women from history. I’ll begin with Fanny Imlay’s Story, Mary’s older half-sister. Let me begin though by telling a little of Percy Bysshe Shelley’s history before he met Fanny and Mary. Shelley published two gothic novels while at Oxford, in 1810 and 1811, while also writing anti-war and atheist based pamphlets. These earned him an expulsion from Oxford and when he refused his father’s help to return to Oxford a separation from his family. He eloped to Scotland in 1811, four months after his expulsion from Oxford and married Harriette Westbrook. He knew Harriette Westbrook through his sisters who attend the same school. Shelley was heir to a Baronete, her father owned a tavern, needless to say Shelley’s father was not best pleased and cut off Shelley’s allowance. Shelley did not even particularly care for Hariette but she had poured out her heart to him in letters claiming misery and of course I have often said before men of Shelley’s era loved to play the gallant. He saw himself as her rescuer. But he had not anticipated that Harriette would insist her elder sister, who Shelley did not like, would live with them. He was disappointed in life again when his best friend showed his true colours and sought to seduce Hareitte when he came to stay. 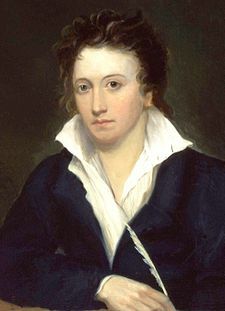 Seeing himself as a political radical, another romantic notion of the era, Shelley sought mental stimulation of men of a similar mind and began leaving his wife behind. He accused Harriette of marrying him for his money and built questionable friendships with women with more stimulating conversations and more active minds. While equalling haunting the company of William Godwin a man who had published political work whose leanings Shelley favoured, although Godwin was equally more interested in Shelley’s money than his views. 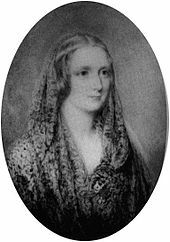 However Godwin had three daughters, Fanny Imlay, Claire Clairmont and Mary, who later became Shelley’s wife. So let me now begin the story of these sisters. 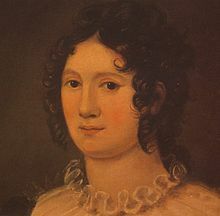 Fanny Imlay was the eldest, she was not William Godwin’s daughter but an illegitimate child her mother had conceived during in an affair with an American entrepreneur. They had commenced the affair during the French Revolution and Fanny was conceived on the border where her parents met regularly. Her father had gone to France to seek commercial opportunity, while her mother was there to promote feminism, having written A Vindication of the Rights of Woman, in 1792. Her mother’s family thought the pair married. They were not and the affair ended badly. Fanny’s father left only to be pursued by her mother who tried to commit suicide on two occasions when he would not have her back. She failed. Then Fanny’s mother met William Godwin and fell in love again, she also fell pregnant with his child but Godwin did marry her. 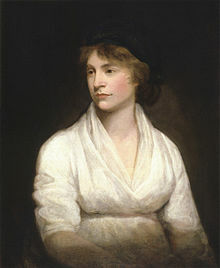 She died shortly after though, giving birth to William Godwin’s daughter, Mary. Fanny was only three at the time and so was raised by a man who was no relation to her. William Godwin remarried four years after the death of his first wife, and his second wife brought another daughter in the household, Jane (who later renamed herself, Claire) as well as a son. Godwin then had another child, a son, with his new wife. But despite this slightly disparaging account of Fanny, it was Fanny he leaned upon, it was Fanny who helped him manage money and support the family. There are copies of letters Fanny wrote to several wealthy benefactors, begging money, which is rather sour when you learn that her own inheritance of £200 was lost due to her step-father’s debts. When Shelley first made contact with Godwin his initial interest was in Fanny who was then 18. Before he had even met her, he asked if she might be allowed stay with himself and Hariette, solely because he admired her mother’s writing. Godwin did not agree because he had no cause to trust Shelley when it was widely known he had eloped to take his wife. But Shelley then began spending time with the Godwins and at this time most of his attention was focused on Fanny. She had enlightened and spirited conversations with him, discussing politics. But then Godwin sent Fanny away to Wales and we can only speculate on why, but perhaps it was because he feared she was at risk of being sucked into an affair, and of course as Shelley was already married it could have had no happy end. But while Fanny was away Shelley fell in love with Mary, Fanny’s half-sister, (whose story I’ll tell in a couple of weeks). With Fanny gone, her father fell further into debt and her step-mother grew more intolerable, and both Mary, who was 16, and her step-sister Jane, desired to escape. Shelley gave them the means and the opportunity for an exiting romantic escape. They fled with him to the continent, leaving Fanny behind alone in Wales. This all occurred in 1814. Fanny was immediately called back to London to support her father in clearing his debts and help her step-mother run the house and look after the two boys in face of scandal and humiliation. Godwin was a man who was widely known and well-respected, with two of his daughters running off with a married man he was a mockery and increasingly embarrassed as they stayed abroad. Fanny was placed in the untenable position of having to write to Shelley and continue to beg money from him. It left her in the middle of a bitter separation as she sought to keep her relationship with her sisters while trying to continue to support the man who had raised her as his daughter. When Mary, Claire and Shelley returned to London in September 1814, Fanny was in the difficult position of wishing to see her sisters without upsetting their father and she balanced both relationships poorly, angering Godwin if she saw her sisters while her sisters ridiculed her for not having the courage to simply leave him and move in with them and Shelley. All through this time Fanny continued to beg Shelley to give Godwin money, while pressured by the fact both men were deeply in debt. In February 1815 Mary gave birth to a child who later died and it was Fanny she called upon to support her through the episode, which only brought more of Godwin’s wrath down upon Fanny. Charles, Jane’s/Claire’s brother then also left home. In January 1816 Mary gave birth to a second surviving child, whom she called William after her father. After this though Shelley, Mary and Claire left England once more, escaping debts and seeking to join Lord Byron abroad. Shelley’s departure increased Godwin’s state of poverty and pressure on Fanny grew. She argued with Mary before she left and they separated on ill-terms, but Fanny, ever the peacekeeper sought to repair the relationship in letters to her sisters. Again her gestures of affection and her desire to keep a close relationship with them was ignored. Life became so difficult for Fanny in the Godwin household while they were away that when they returned again and took up residence in Bath, she began asking if she might join them in letters, and stating she wished to escape. She was not welcomed, and on the 9th October 1816 Fanny took her own life. She left her father’s house and went to Swansea, and her suicide must have been planned and long considered I should imagine. She posted letters to both her father and Mary in the midst of her journey to Swansea, from Bristol, writing to the two people who had torn her apart as she stood in the middle of their bitter war and scandal. It is distressing to think she was born the daughter of a woman who had so strongly and publicly declared a desire for women to be free of the rule of men, and then both herself and her mother had ended up being ill-used by men, her mother by Fanny’s father, and Fanny by her mother’s second lover. Whatever those letters said, and no one now knows as they were destroyed, both Shelley and her father were so disturbed by them they immediately set out for Swansea. They were too late. Fanny took and overdose of laudanum to end her life. She had taken a room in an inn, the Mackworth Arms, and instructed the chambermaid not to disturb her. She was found dead the next day. Shelley and her father arrived the day after and Shelley was left to cover up her death, removing her name from her suicide note, and any evidence which might associate her name with her father or himself (suicide was an unbearable sin in those days and both Godwin and Shelley bore enough scandal they did not wish more). She was buried without being recognized by either man and probably lies in an unmarked grave. Another sorry end I’m afraid. Sadly there are no pictures of Fanny, perhaps a reflection of how little she was appreciated by her family. But if you follow this link you can see the image of the letter Fanny’s father wrote to Shelley after her death, click on transcript to read the letter. Posted on November 4, 2012 by janelark •	This entry was posted in History, Regency Stories, Scandalous Women, Stories from the City of Bath and tagged 1800s, 19th Century, author, Bath, Claire Claremont, Fanny Imlay, history, Jane Lark, Lord Byron, Mary Shelley, Percy Shelley, Regency dress. Bookmark the permalink.